Leigh Community Art Group: Boothstown Will Never be The Same Again! Boothstown will never be the same again. Our last local show of the year is on Saturday, 7 December which is TOMORROW! We haven't put on a show here before so we are looking forward to it with keen anticipation. Everyone is busy, busy, busy at this time of year. However please try and put some time aside to treat that special person in your life to something unique at a very reasonable price and get double brownie points at the same time. If you see anyone with a white beard and a red ganzie stuffing himself on the mince pies, with a sleigh in the car park pulled by several strange quadrupeds, he is definitely not one of our artists. We hope to repeat last month's success at Culcheth. Over a dozen of our club's artists are expected to exhibit with over 200 paintings on show. Many of our artists are willing to accept commissions at very reasonable rates so if you like someone's style but not the subject, just ask, as we are always happy to help. Our members pride ourselves on our the warm welcome we extend to visitors and new members. Looking ahead to 2014, our club is always looking for new members, regardless of ability, who are interested in joining our club. We are particularly interested in beginners and any artists who are willing to contribute towards the development of the club with ideas and energy. Why not make new friends and get out a bit more? Boothstown is an exciting new venue for us so we look forward to seeing you there and making new friends. 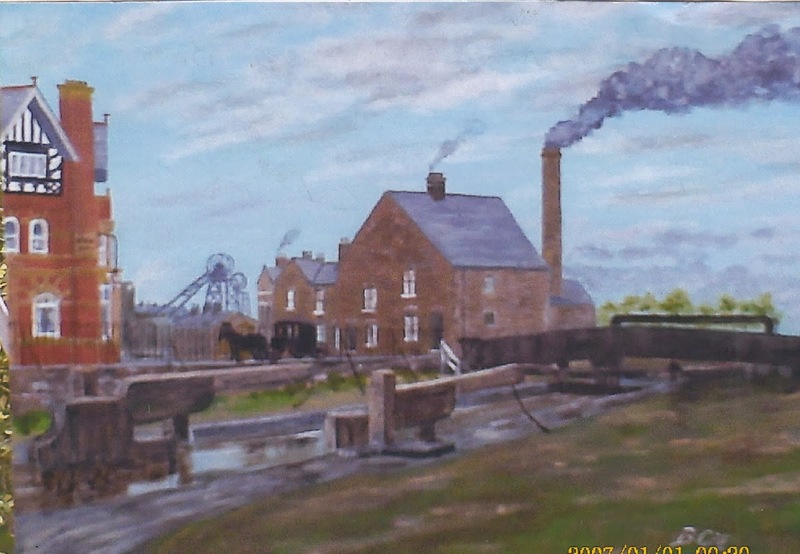 "Plank Lane Old Bridge 1907", acrylic by B. Gill.